Spaghetti squash and a buttermilk based sauce make this main dish or side a great lighter option, great flavor without the guilt. A really healthy and delicious version of Fettuccine Alfredo. Start by baking the squash in a preheated oven set to 350 degrees. I like to cut the squash in half lengthwise, then add a little olive oil and bake for 45 to 55 mins, depending on the size of the squash. 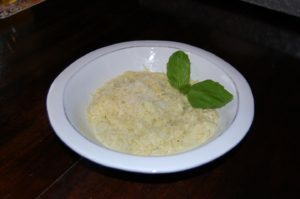 While the squash is cooking, heat a sauce pan to med to med low heat, add the truffle oil (you can use any oil but the truffle oil adds great flavor) buttermilk, and lemon to a slow boil, then add the sour cream, grated parmesan cheese and salt to taste. Reduce to a slow simmer and stir often. Once the squash is cooked, use a fork to remove from the shell, the “meat” of the squash will start to lift out of the shell and look like spaghetti noodles. Add the squash to the sauce pan and saute for another few minutes letting all the squash to be saturated by the sauce. Depending on how light or how creamy you want your sauce, you may want to add corn starch or use real cream or even add cream cheese to make it thick and creamy. Because this is meant to be a totally healthy version of Fettuccine Alfredo, I have opted for a lighter thinner sauce. Serve with a little fresh parmesan on top and fresh basil if you like.